This is the 2004 Italian hardback edition of The Wailing Wind, published by Piemme in Casale Monferrato, Italy. The text was translated into Italian by Roberta Bricchetto/Grandi & Associati. 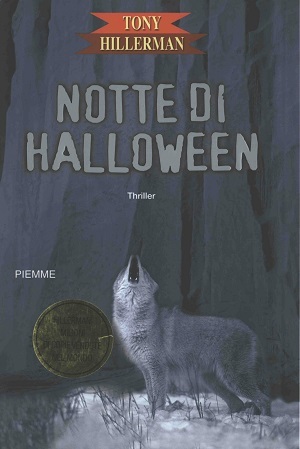 The title translates to "Halloween Night." The cover was designed by Studio Aemme. The cover photo by Corbis/Contrasto features a howling wolf. Format: Hardback, 21.7 x 13.5 cm. Binding: Bluish-grey boards with illustration from dust jacket. Author's name, title and publisher are printed vertically on the spine.